The first Life of an Architect post of the new year … no pressure. I typically hate writing the first post of a new year, it feels a little like that first sketch in the schematic design process – you know it isn’t going to be any good but you have to start somewhere; you’re just feeling things out a bit wondering where you want to take things. This will be the 6th new year’s post that I’ve assembled. Let’s take a stumble down memory lane at the other “first post of the New Year” articles to see if I’m getting any better at this blogging thing. Worth Reading? Scale of 1-10: I’m going to say 4 for brief humor and because there isn’t anything particularly insightful in this post other than I received 368 meeting invitations in December for the upcoming year. Worth Reading? Scale of 1-10: A solid 7 … with a random section of 3 in the middle. Best Sentence: There aren’t any shortcuts, you may have the ability to move through these categories more quickly than others, but make no mistake, you do need to go through the process. Worth Reading? Scale of 1-10: Another solid 7 … I’d even go as high as an 8 if you have a blog yourself. Best Sentence: Depending on how you choose to measure success, my time spent working on this site was either a smashing success or simply a lot of time spent entertaining myself. Worth Reading? Scale of 1-10: This one is total crap, a 2 at best. Worth Reading? Scale of 1-10: This one deserves a 6 even though in reality it’s a 4. This was an important post simply because I choose to do something that few people ever do, I showed all the traffic to my website for what it really was and discussed how things were growing and evolving. Best Sentence: I thought this post would be of value to my readers so they knew that they were a part of something good … actually it is something great. 2010 – Who Wants to be Relevant? (while I wrote this post on January 14th, it was the first post I ever wrote was so in a sense, it is the ultimate first post of the year). Worth Reading? Scale of 1-10: This one is a 9, mostly because it was the first post I ever wrote, it was a good one, and looking back on it 6 years later, it has an Oracle sort of read to it. The post that started it all is definitely worth reading if you haven’t already done so. Best Sentence: Finding a place that is somewhere in the middle is exactly where I think I’m most comfortable, not very exciting but I’m happy to think I have a place in what was and what will be. Since this is not my first “first post of the new year”, what’s a guy to do? I’m going to treat this post like any other post and I’m going to introduce and talk about something that is right in front of me and is occupying more of my mental faculties than it should. Copyright Infringement. Don’t lie, you did NOT see that coming! I get stuff stolen off my website all the time – literally every day. Some times the infraction makes me a little more crazy than other but what can a person reasonably do about it other than rely upon other people to do what is right? Okay, I know that’s stupid – most people (when it comes to the internet) don’t do what’s right so let’s zoom in on some parameters for what is acceptable. I get it if someone who is a blogging hobbyist doesn’t know all the rules, but if you are the Chief Editor of a magazine that gets distributed quarterly to every single Home Depot location, you think you would know that you can’t just go online and take an image and use it. That’s what happened to me this last Fall when I started receiving notifications from people around the country that they saw one of my drawings in the most recent ProConstruction Guide (did I mention you can get a copy for free any every Home Depot location?). They didn’t even say where the image came from … they just took it and used it because it suited their needs. So I did what any reasonable person would do when they think they have been damaged and had their work stolen from them without any sort of compensation or remuneration. I sent them a message asking them to please explain their behavior and how this sort of thing could possibly happen. The woman who contacted me (whose name I will leave out of this post) basically told me during our initial conversation that this wasn’t their fault, that they didn’t know where the image came from, that it was all over the internet and there was no way to tell. Really? That’s your logic?!? That it’s all over the internet so it’s not your fault since you couldn’t tell where the image came from. Not only is that a terrible reason, it is factually ignorant. If you are a big time publisher (an assumption I am making because they are responsible for creating the free magazine distributed in ALL HOME DEPOT locations) you should know that this is something you just can’t do. If you don’t know where an image came from, you don’t move forward with that image. PERIOD. The other problem with her response was that she knew that they used an unattributed image without me even bringing it up. Did you know that you can do a GOOGLE search on images? You can … once you find an image, you can search the internet for that image. So the image that they took without permission or attribution is shown above – the drawing was one of the wall sections I drew a long time ago and featured in a post called “What Makes You a Designer?” written January 13th, 2011. Once you find that image, if you look at #1 in the image above, this section reads “Search by Image” which will do exactly that – it will search the internet for this image. For grins, I also boxed out #2 above which reads “Images may be subject to Copyright”. So once you click on “Search by Image”, you’ll get the next page (commonly referred to as the “results” page) and you can find all the locations where the image is now being used. You might be surprised to find a whole lot of your work floating around out there that you never new about. 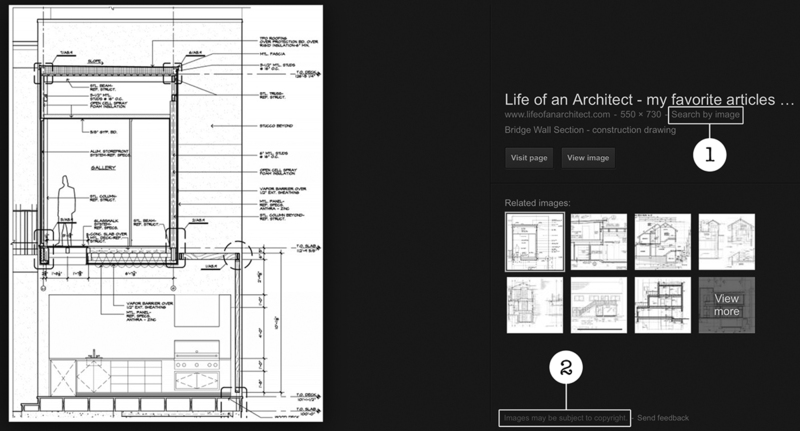 So here is a look at what happens when you do a search for this image … a handful of images are returned, and all attribute the image back to me and ‘Life of an Architect’. So this has to make me wonder – how again did they think they this image was in so many places on the internet that it was impossible to figure out where the image came from? Are they lying or incompetent? When I spoke to this person on the phone, they all but blamed me for not having my name on the image (shame on me) so, clearly I am partially responsible for creating this situation. Wait. WHAT?!? The entire process irritated me to such an extent that I spoke to an intellectual copyright attorney who said I could make things a little painful for this company and should I choose to do so. Since I am not a litigious person by nature, I haven’t done anything about it yet. I wanted to see how the editor of this publication would respond after some time had passed and to date, I haven’t heard from them – I think they are hoping things are simply going to go away. I should also add that they did offer to pay me what they normally pay of images, $10. Of course, that’s what you pay before you steal an image and then try to blame someone else. Wonder what the rate is once attorneys get involved?? So what does this mean to you and me? Well, it’s making me rethink what sort of images I need to watermark and register with copyrights. There are a lot of rules but basically it would cost me $35 per image, photo, drawing, etc. to copyright them. (This is when I remind you that I don’t sell posts or ads on this site and paying $35 per image, photo, drawing, etc. is a deal breaker). The thing that really rubs me the wrong way (once you get past the apparent lying, stealing, and cheating) is that the quality of the image they used is terrible! And it’s not like people didn’t know it was mine – that’s how I found out this situation in the first place. I generally try to avoid putting poor quality images on my website, even if they don’t have my name on them … because as it turns out, people do know that they are your images. So now I have to figure out how I can protect the work I put on this website – not something that I really want to be spending time on this year. I have no doubt that this experience will have a negative impact on what I decide to write about and share on the website – which is unfortunate because ultimately, we all lose in that scenario. Did you also know that I had my identity stolen a handful of times in 2015. Nothing to damaging but apparently I am a highly desirable character on dating websites for elderly folks. I received a handful of calls – the two most recent were just in December. The first from a woman in New York (or New Jersey) who was about to take her relationship with me to the next level (i.e. actually meet face to face) when “I” asked her from some money. I believe the money was needed to get some materials through customs for a project I am currently working on in London. The only reason I know about it is because she decided to look me up and track me down to see if I was really “Bob Borson, Architect” that she had been speaking with. The “other Bob Borson” even told her to look me up to verify that he was who he said he was … I suppose he didn’t think that she would call me on the phone. Another call was from a guy who was super pissed off because apparently I kept calling his mother and convincing her to send me money. He told me how she was on a fixed income and what I was doing wasn’t right. Luckily it didn’t take too long to convince him that I was not the Bob Borson, Architect, that had been calling his mom. He even had his mom call me so I could tel her to stop sending the other guy money. Here’s hoping that 2016 isn’t the year that I finally crack.